KATHMANDU, April 20: The government mobilized total revenue of Rs 172.17 billion in the third quarter of Fiscal Year 2016/17 -- a jump of 32 percent compared to revenue collection figures of the corresponding period of the last fiscal year. According to the Inland Revenue Department (IRD), the collection is 104 percent of the target set by the government. The Ministry of Finance had set a target of collecting Rs 165.16 billion by mid-April, 2017. While collection of income tax and excise duty has exceeded the target, the IRD missed the target in value added tax (VAT), education service tax and health service tax. Statistics of IRD shows the government mobilized Rs 95.4 billion in income tax, which is 107 percent of the target set for this period. Similarly, Rs 32.36 billion was collected in excise duty compared to the target of Rs 31.07 billion. The government collected Rs 594.45 million in education service tax and Rs 761.13 million in health service tax in the review period. The collection was only 95 percent and 86 percent, respectively, of the target set by the government. Collection of VAT also disappointed the government in the review period. Though the government had set a target to mobilize a total of Rs 43.31 billion through VAT, it missed the target by Rs 255.33 million. Issuing a statement, the IRD said that it was optimistic about meeting the annual revenue target. “Revenue collection, so far, has remained higher than the target,” the statement added. 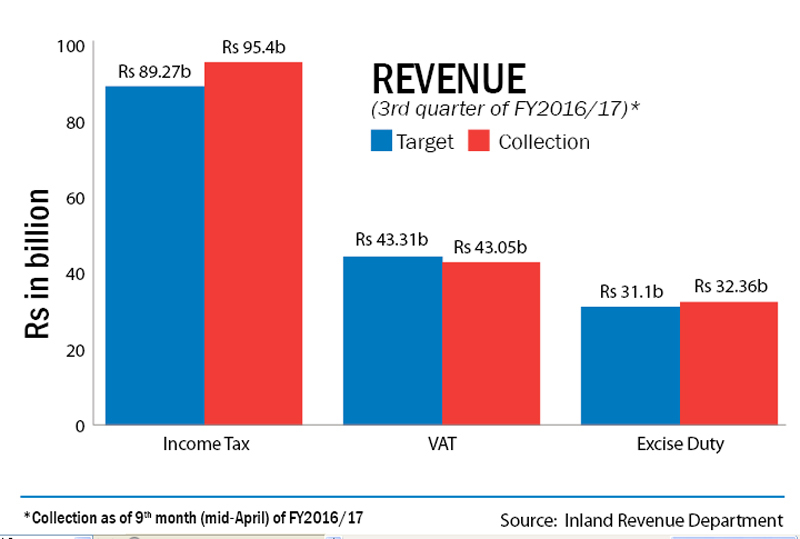 While revenue collection has exceeded the target, the money has largely remained unspent. The government has been failing to meet the development expenditure target, leading to high treasury surplus.